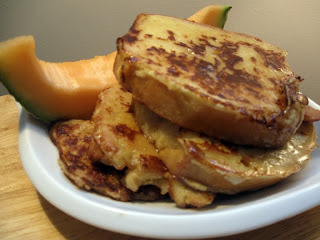 I had always wanted to try French Toast with coconut milk, and you know what? It was so good! I also made the brioche bread specifically for making the french toast. Of course you could use any bread, and store bought bread might work even better. I was just taking the time to experiment. 1. Break 3 eggs and add to a bowl or flat pan that is a little deep. The wider the dish the better because you are eventually gonna sit the bread in it. But you can still do all the mixing in a bowl. Add 1 can of coconut milk. Then add your spices (cinammon and nut meg to your liking), 1 tsp of sugar. And then beat the mixture well so it all combines. 2. Dip in bread and cover the bread and let it soak up the egg mixture. If the bread is thicker and denser it may need to sit for a while to soak it up. If it's softer and not to thick, it may not have to sit for more than a minute. 3. Fry eggy bread in a frying pan with your choice of grease. So that it doesn't stick. Maybe a few minutes each side. Depends how hot your pan is. But peel up the bread to see how it's doing and flip when you get a brown golden crust. 4. Top with maple syrup. And if you really want to kick it up a notch, top with some chopped pecans as well.